This most famous Russian opera receives a curiously tawdry, emotionally stilted treatment at Bavarian State Opera. Transplanted to a winter sports lounge in the swinging ’60s, the morals and traditions of the time-honoured tale make some degree of sense, but belief must be suspended too often for the concept to fully make sense. We enter to an open stage, showing a large sports lounge with high windows, gaming machines, billiard table and a small black and white television showing Winter Olympics. As the large chorus enters the space, snippets of the score are heard in a tinny tone, as if accompanying the ice-skating on the television. Larina and Filipjewna sit on comfortable lounge chairs downstage, as Larina’s daughters Olga and Tatiana, looking like a folksy duo, prepare for a song on microphones. Blonde Olga wears a shimmering pale green mini-dress, while mousy Tatiana keeps locks of her long curly hair in her face, and dissolves into her book when the chorus folk start to sing. Olga’s tall, black-clad boyfriend Lenski arrives, and introduces his friend Onegin, a tousle-haired, shorter man with a small moustache. Perhaps they have come straight from Brokeback Mountain, as we are about to see in this heavy-handed, subtext-on-the-top production. While it is quite believable that the sexual revolution has bypassed the modest Tatiana, there is nothing on stage to give any indication as to why she would then suddenly develop such strong feelings for Onegin. Based on her books and Filipjewna’s tales, it is as if she is suddenly just in love with love. Frustrated at trying to write her thoughts in a letter, she records her thoughts on a small tape deck, giving Filipjewna the cassette to pass on to Onegin. Given the lack of arias in Tchaikovsky’s score, the “letter” scene is the first chance to spend intimate time with a character and Kristine Opolais, as Tatiana, makes the absolute most of this opportunity, fully immersing herself in the music and the emotion. As Tatiana waits for Onegin’s reply, she is joined by the women, for some indeterminate reason, who stand at a lowered, empty lighting bar as if waiting for men in Sweet Charity‘s dance hall. Fine Polish baritone Artur Rucinski delivers an excellent performance of “Were I A Man Whom Fate Intended,” as Onegin gently lets down the love struck young girl. 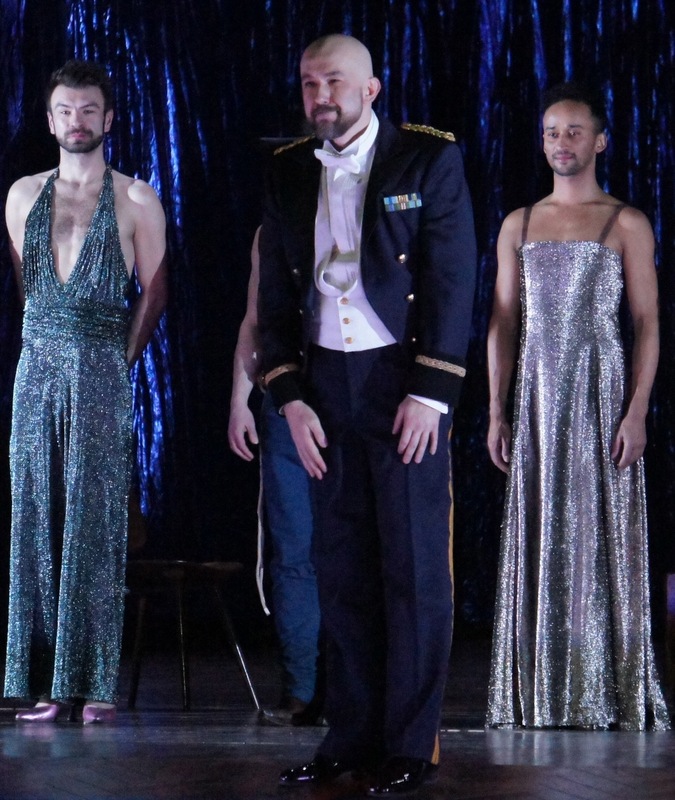 Director Krzystof Warlikowski’s interpretation of Onegin’s sexuality becomes clear in the following scene. Onegin cannot bear for Tatiana to touch him, and does not enjoy dancing with her, frequently watching his close friend Lenski. He annoys Lenski by attempting to waltz with him, and shocks one and all by eventually planting a big kiss on the mouth of his friend, bringing the act to a disappointing close for all the characters. Also worth mentioning is that while Tatiana’s birthday celebrations may include a traditional birthday cake with candles, it also includes gifts of a big toy penguin, gold shoes, and a Full Monty-style of striptease by a group of sailors. Entering the house for the second half, we see the same scenery, but now inhabited by shirtless, blue jean-wearing cowboys. They stand downstage at the lighting bar in the same way the women did earlier. Onegin and Lenski, fully dressed, lie centrestage in a big bed. Edgaras Montvidas as Lenski gives an emotional, sweetly sung rendition of Lenski’s aria “Kuda, Kuda,” while the cowboys reconvene outside at the petrol bowser. The crucial duel scene cannot be included as originally intended given the updated setting. Just as Lenski finally takes off his shirt and, unbuckling his belt, approaches Onegin on the bed, Onegin takes a gun and shoots him. 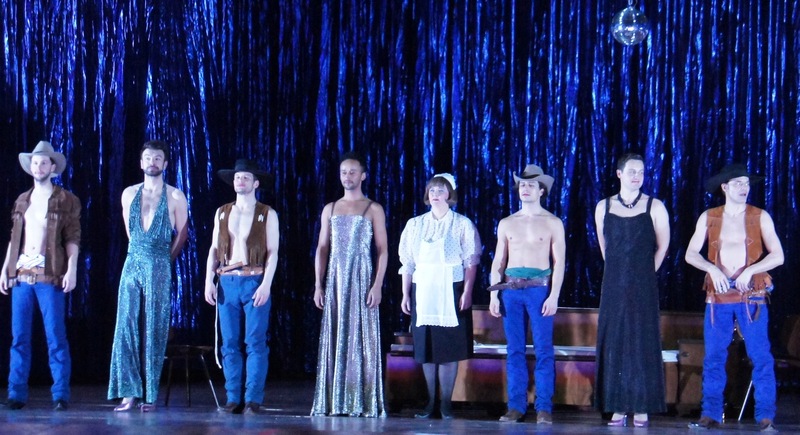 While Tchaikovsky’s music usually inspires visions of sugarplums, Onegin is haunted by line-dancing gay cowboys, who waste the magnificent “Polonaise” on their shenanigans. The stage is surrounded on three sides by shimmering metallic blue curtains. Gremin enters with the chain-smoking Tatiana, as the men appear upstage unattractively dressed in limp ballgowns. Powerful bass Rafal Siwek sings “All Men Surrender To Love’s Power” with a masterful rumble. Virtual strangers, there is of course no way Tatiana and Onegin will possibly be reunited, and he is left heartbroken, a victim of society’s judgment and of his own destructive nature. 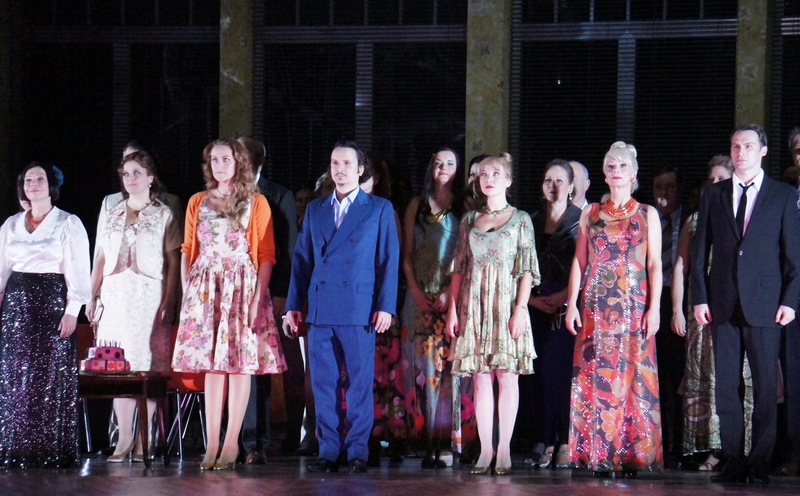 Eugene Onegin was reviewed at Nationaltheater, Munich, where it will be performed again on 10 January 2014. 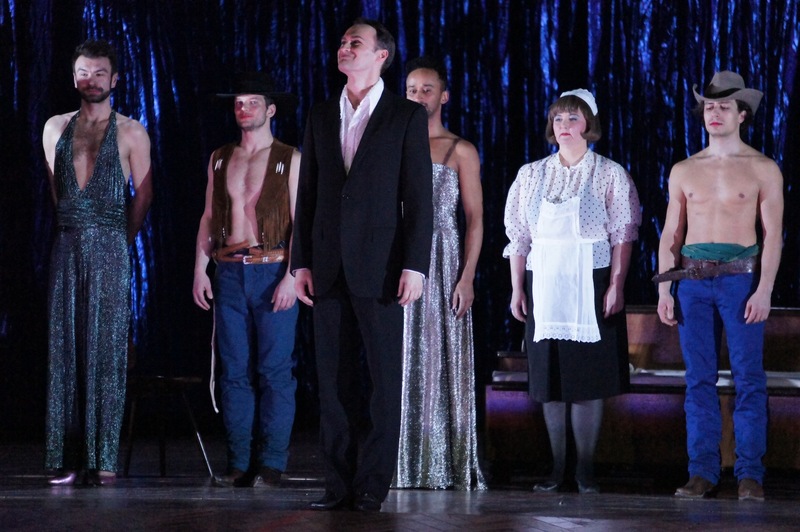 To see production images of Eugene Onegin, click HERE.